I'm a male 69 and would like your advice on what Pilates I might want to do to keep in shape and build strength in my back and abdomen. I'm pretty active but have stiffness in my lower back especially after I snow shoed up one of the blue ski runs at A Basin in Colorado. I do stretches pretty much 4/5 days a week but would like to have more freedom of movement without pain. Hello Larry and thank you for your question here. Continue doing the stretching daily. In addition add some Pilates exercises for core strengthening. My suggestion would be Pilates Bridges or Pelvic lifts for hip, back, and leg strength. Prone (stomach down), Swimming exercise to strengthen the core muscle contractors of the abdomen and back. From a kneeling position (hands and knees) opposite arm and leg stretches. Reaching strongly from the trunk or abdomen opposite arm and leg reaches only to parallel of the body. Here are few of those pages with exercises and descriptions of exercises. The ebook has over 30 pages of descriptions and exercises. Pilates Bridge or Pelvic Lift. 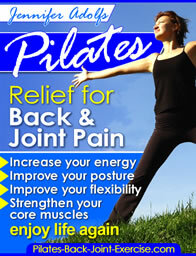 Pilates Ebook – Relief for Back and Joint Pain.